In grammar, a sentence is the basic grammatical unit. It contains a group of words and expresses a complete thought. Here are five kinds of sentences by purpose. Sentences which make simple assertions or statements are called assertive or declarative sentences. The child is going to school. Note: Assertive or declarative sentences may be positive (affirmative) or negative. Sentences which give a positive or affirmative sense are called affirmative sentences. I have been to Canada. Sentences which give a negative meaning are called negative sentences. She will not listen to me. She should not hate anybody. Sentences which ask questions are called interrogative sentences. 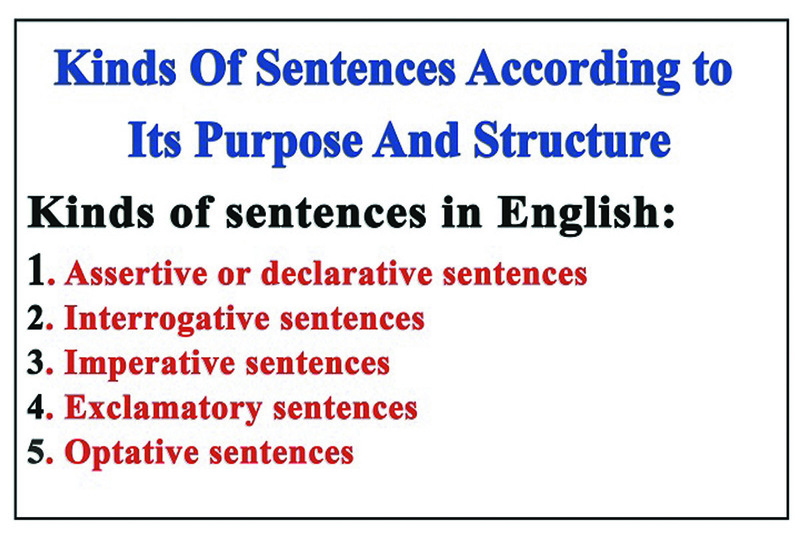 Sentences which express orders, commands, requests, advice, proposals or suggestions are called imperative sentences. Sentences which express some strong feelings or emotions such as joy, sorrow, regret, surprise, wonder etc., are called exclamatory sentences. How beautiful the flower is! Alas! She is no more. Sentences which express an ardent wish, prayer, curse etc., are called optative sentences. A sentence can be simple, compound, complex or compound complex. 1. Simple: Contains a single, independent clause. Our school basketball team lost their last game of the season 75-68. 2. Compound: Contains two independent clauses that are joined by a coordinating conjunction. I don’t like dogs, and my sister doesn’t like cats. You can write on paper, or you can use a computer. 3. Complex: Contains an independent clause plus one or more dependent clauses. I don’t like dogs that bark at me when I go past. She did my homework, while her father cooked dinner. 4. Compound-complex: Contains 3 or more clauses (of which at least two are independent and one is dependent). I don’t like dogs, and my sister doesn’t like cats because they make her sneeze.